Many cities in the US are banning or considering banning plastic shopping bags in an effort to minimize waste and pollution. Some retailers and grocery stores have already begun the practice of charging a small fee for using a plastic or paper shopping bag. Considering these changes, using custom tote bags can be a smart choice for your company or organization. Choose from a Wide Variety of Custom Tote Bags! PromotionChoice has a wide range of tote bags available to choose from—many sizes, many colors, and many different materials. Order a quantity of the style of your choice and they can be used by customers in place of plastic or paper bags. Keep a quantity on hand to give out to your clients, or if you are a retailer, you can sell them to shoppers. A Promotional Tool that Helps Both the Brand and the Customer. The benefit of these promotional tools is that it benefits both the company or organization AND the client or customer. You have the opportunity to advertise your brand while raising awareness of environmental pollution. For the clients and customers, they can take home a useful product and do their part in reducing waste. 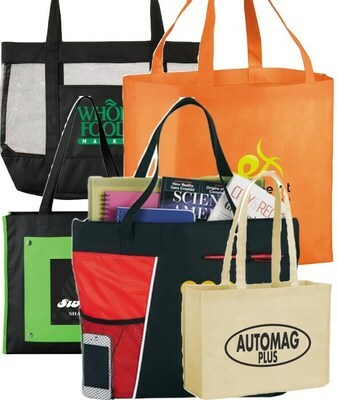 If you have a trade show or convention coming up, order some totes to give away. Schools can use the bags with sports teams or clubs printed on them and sell them as fundraisers. Because the bags are available at competitive prices, they can be sold at a low cost. Even giving them away won’t take a big bite out of your budget, because of their pricing, and don’t forget the potential growth that can result from the increase in brand recognition! A Bold Design and Clear Graphics will Draw A lot of Attention! Many of the bags have a generous imprint area, which allows for a bold, attention getting design. A good graphic and clear text will determine how long a client or customer continues to carry the bags with them. You won’t have to be concerned about the print quality, PromotionChoice offers high quality printing. Spending a little extra time on the design and using high resolution graphics will lead to an impactful product. If you have questions, don’t hesitate to ask us! We can provide virtual proofs so you can see how your design will appear on the product. With a sharp, bold design, you will ensure that customers will use and reuse your promotional tool. Imagine all the exposure your company or organization will get for over a year or more. Customer will use these bags at the grocery store, farmer’s markets, retail stores, the beach, going to a friend’s house, at the library or bookstore, while camping or going for a walk in the park, the uses are nearly endless! Everywhere the bags go, your brand will be noticed. Now, just multiply that exposure by the number of bags distributed! Order from PromotionChoice Today! We are Here to Help You! Take a look at our wide variety of choices and order you custom tote bags today! It is never too soon to get your brand out and noticed by countless potential new clients and customers!